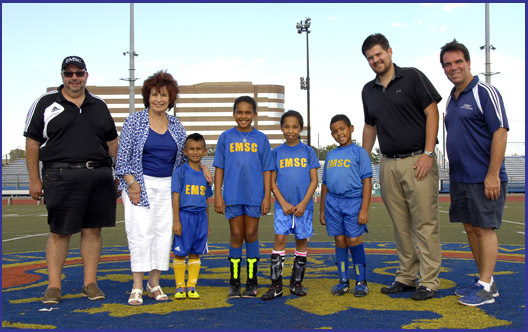 Presiding Officer Norma L. Gonsalves (R-East Meadow, LD 13) attended the East Meadow Soccer Club’s Finals match held at the Stadium at the Mitchel Athletic Complex in Uniondale. The event serves as a culmination of the soccer season and provides a stage for the top two teams to showcase their talents and compete for a championship. Pictured (l-r): Eric Schwartz; Presiding Officer Norma Gonsalves; John Borelli, Community Ambassador; Tom Reilly and members of the East Meadow Soccer Club. ⇐PreviousNassau County Department of Assessment 2014 Extended HoursNext⇒Nassau County Hurricane Season is Here - Are You Prepared?